Join the Church of Saint Agnes in Saint Paul, Minnesota as they offer a Solemn Mass for All Souls’ Day on Monday, November 2, 2015 at 7:30 pm. The Twin Cities Catholic Chorale with orchestra will sing the Mozart Requiem Mass K. 626. 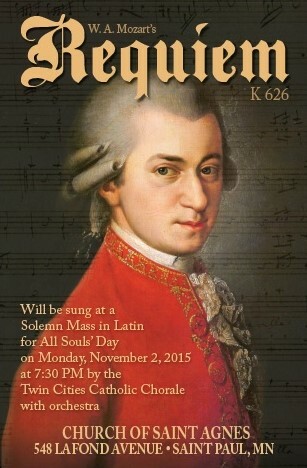 For more information, visit the website of the Twin Cities Catholic Chorale at http://www.catholicchorale.org/.